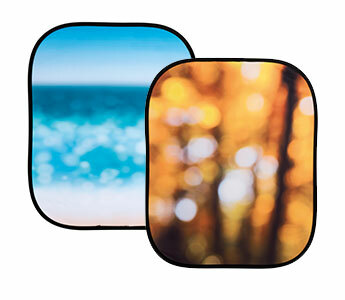 July 31, 2014 Geren W. Mortensen, Jr.
Lastolite have just announced soft focus portable backgrounds -- basically a collapsible background sized for shooting head-shots or mid-body shots that is printed with an out-of-focus image already on it. There are two of them so far, and each is reversible with a different "scene" on each side. To be honest, I'm not sure how I feel about this. On one hand, it allows almost anybody with an extra couple hundred bucks to take a portrait without a distracting background. One the other hand, it allows almost anybody with an extra couple hundred bucks to take a portrait without a distracting background. Yeah, that's right. It takes a lot of the skill -- the craft -- out of making a portrait. Sure, you still have to do a reasonable job of lighting, because you don't want to have shadows fall on the background and give the trick away, but this could be accomplished simply with a single strobe in a softbox or one of Gary Fong's Lightspheres, or by bouncing the flash off a white ceiling. So, boom, stick on a flash, stick up the background, drag the model in front of it and click. I can see a whole range of point-and-shoot mall studios popping up, offering a portrait your choice of four backgrounds for $19.99. Yawn. Of course, the idea is nothing new. Back in January, Petapixel posted an article (No Paris? No Problem! Using a Backdrop and Shallow DOF to Fake a Location Shoot) about using a program called Rasterbator to print a background from an image snagged from the internet. That could easily be made to appear out of focus with even a moderate aperture. In this case, though, the idea was to cheat a particular location. I guess that as a photographer who has been working on his craft for many years, I really do fall down on the side of the coin that Lastolite's new product is a lazy photographers' gimmick -- another piece of kit that would allow a mediocre shooter to further erode the business of pros who really know what they're doing. The same goes for the Petapixel article, unless, maybe, you use your own image to make the background. Maybe. Or, it could be that I'm way off base on this. How do you feel about it? Leave me a comment below (preferably on the blog, not on Facebook or Twitter).